Let me pick my jaw up from the floor because Shadow and Bone was one amazing book. I’ve read mostly great reviews for it, but kept putting it off and now I’m asking myself why I waited so long? There wasn’t a bad thing about this book. 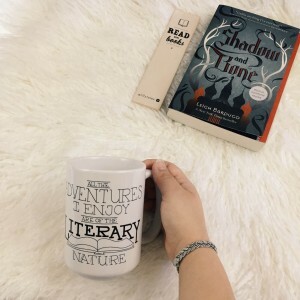 From the characters to Leigh Bardugo’s writing, the world she wrote about to the magic in her books, everything about Shadow and Bone was compelling – I didn’t want it to end! I loved how Leigh made Alina a simple character before finding out she has a power she knew nothing about. Alina was a character I could easily relate to thanks to her simple origins. She faced many trials because of this, but I watched her grow into a character who harnessed her power. I’m looking forward to reading Siege and Storm to see how much further Alina grows. As much as I loved Alina, I loved the Darkling even more. He was dark and yet I found myself drawn to him. Maybe more often than I should have, I was really rooting for him. There was also Alina’s best friend Mal who I didn’t like at first, but really grew on me at the end. I would have to say that what I found the most enjoyable was the magic. I loved her world of Grishas, the different powers they had, and the kefta robes they wore depending on their power. I was easily able to imagine the purple, blue, and reds of the Grisha and the one and only black Darkling among them. Truly an amazing story. I will definitely continue on and would love to do a reread eventually.